: Of French origin and more precisely, from the centre of Brittany. At present, in first place numerically among French sporting breeds. Probably one of the oldest of the spaniel type dogs, improved at the beginning of the 20th century by diverse outcrosses and selections. 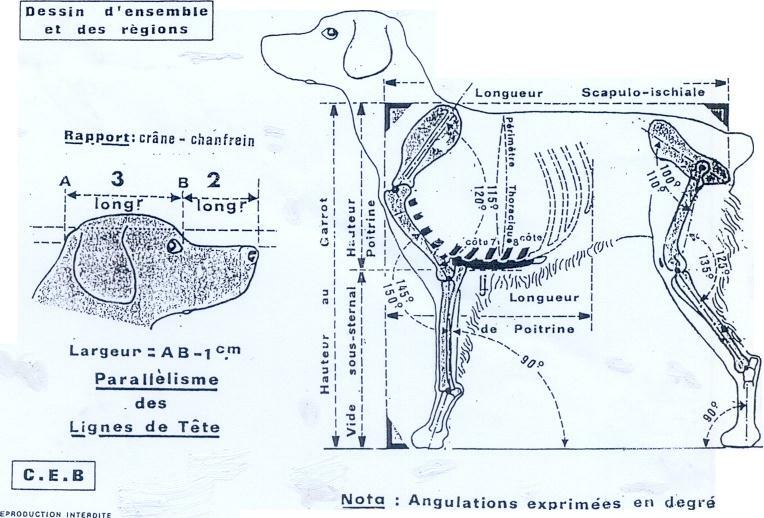 A draft of a breed standard drawn up in Nantes in 1907 was presented and adopted at the first General Assembly held in Loudéac (in former Côtes du Nord department, now Côtes d’Armor), June 7, 1908. This was the first standard of the « Naturally Short-Tailed Brittany Spaniel Club ». : Smallest of the pointing breeds. The Brittany spaniel is a dog with a Continental spaniel-type head (braccoïde in French) and a short or inexistent tail. Built harmoniously on a solid but not weighty frame. The whole is compact and well-knit, without undue heaviness, while staying sufficiently elegant. The dog is vigorous, the look is bright and the expression intelligent. The general aspect is « COBBY » (brachymorphic), full of energy, having conserved in the course of its evolution the short-coupled model sought after and fixed by those having recreated the breed. The skull is longer than the muzzle, with a ratio of 3 2. The scapulo-ischial length (from the point of the shoulder to the point of the buttocks) is equal to the height at the withers (the dog fits in a square). : Dog adapting itself to any environment, sociable, with an intelligent and attentive expression, mentally balanced. Versatile pointing dog, for any game on any terrain, precocious in revealing its hunting passion. Remarkable in its searching for game, its gaits, its scenting ability, its ranging in the field, its spontaneity and duration of pointing, its retrieving and its aptitude for training. : The features are fnely chiselled. The skin fits tightly. : Slightly rounded as seen from the front or the side. Seen from above, the lateral surfaces are slightly convex. The top lines of the head and the muzzle are parallel. The width of the skull measured between the zygomatic arches is less than its length. The supercilliary arches are not prominent but form a slightly rounded curve. The frontal furrow as well as the sagittal crest are slightly defined. The stop is moderate. The occipital crest as well as the zygomatic arches are moderately defined. : Large, with very wide, humid and well-open nostrils, of a colour in harmony with that of the coat, as is the case of the edges of the eyelids and natural orifices. : Straight, with lateral surfaces practically parallel. : Not loose, not very large, relatively thin and fitting tightly. The lower is discreetly masked by the upper whose contour bends progressively until reaching the commisure, which is not too apparent and tightly closed. The whole is free of depigmentation. : The teeth are set square to the jaws and form a complete and healthy set. Scissors bite. : Not heavy, the skin fitting tightly. : Slightly oblique. With an intelligent, soft and frank expression. Somewhat oval, not protruding, with fine, well pigmented, tightly fitting eyelids. The colour of the iris is in keeping with the colour of the coat, preferably dark. Eye expression coupled with upward movement of the base of the ears gives rise to the true « Brittany expression ». : Set high, triangular in shape, relatively large and rather short, (drawn forward, the tip of the ear reaches the stop). Partially covered with wavy hair, especially in the upper part, the extremity being covered by short hair. Always quite mobile when the dog is attentive or in action. : Of medium length and well muscled, in the form of a slightly curved, never arched, truncated cone. Set smoothly to the shoulders and without dewlap. : Level to the loins and the beginning of the croup. : Sufficiently mobile and hardly protruding, without being loaded. : Straight, short and rigid, well coupled. : Short, broad and muscular. : Hip: Very slightly slanting, broad and muscular. : Let down to elbow level, broad with ribs well sprung but not barrel chested. Sternum wide and scarcely rising towards the rear. The rearmost ribs long and supple. : Slightly rising and short. : Set high, carried horizontally (or slightly lowered), often lively when the dog is attentive or in action. The Brittany Spaniel can be born tailless or with a very short tail. When the tail is docked the ideal length is from 3 to 6 cm, the docked tail should not exceed 10 cm. : Limbs well poised. Joints flexible and sturdy. : Mobile, long (30% of the height at the withers), close to the body with thick muscle. Its slope is that of a galloper, between 55 and 60 degrees from the horizontal. The tips of the shoulder blades are separated by 5 cm (2 ’’). : Heavy, thick and very muscular. It is slightly longer than the shoulder blade. The scapulo-humeral angle (between the shoulder blade and the arm) is between 115 and 120 degrees . : Close to body - neither in nor out. : Muscular and clean. Slightly longer than the arm. It should be practically perpendicular to the ground. : Solid while maintaining a certain flexibility, slightly oblique (between 15 and 20 degrees from the vertical). : Rather round, toes tight, pads firm, toenails short. : Longer than the forefeet, while maintaining the same characteristics. : Limbs well poised and parallel when seen from behind. : Important with thick and bulging muscles. It should be slanted between 70 and 75 degrees from the horizontal. : Very slightly longer than the thigh with clean, bulging muscles. Broad in the upper part, diminishing gradually in size towards its junction with the hock. The angle between the upper thigh and lower thigh is close to 130 degrees. : Clean, with visible tendons. : Solid, nearly vertical when seen from the side. : The different gaits are easy but powerful, even and lively. The legs move straight without exaggerated bouncing of the body and without rolling, the top line staying level. The canter is the most common gait in the field, the strides are rapid and of medium length, the hind legs having little extension to the rear (collected canter). : Fine, tight fitting and well pigmented. : The coat is fine but not silky, lying flat on the body or with a hint of a wave. Never curly. Short on the head and the front of the limbs. The hind part of the latter has a heavier coat, furnished with abundant feathering, diminishing along their length down to the carpus (wrist) or the tarsus (hock), or even lower. White and orange, white and black, white and liver, with more or less extensive irregular white patches. Piobald or roan, sometimes with ticking on the top and sides of the muzzle or the limbs. Males: 48 cm minimum (18,9 ’’) with a tolerance of 1 cm (0,4 ’’). Males: 51 cm maximum (20,1 ’’) with a tolerance of 1 cm (0,4 ’’). Males: Ideal height 49 to 50 cm (19,3 ’’ to 19,7 ’’). Females: 47 cm minimum (18,5 ’’) with a tolerance of 1 cm (0,4 ’’). Females: 50 cm maximum (20,1 ’’) with a tolerance of 1 cm (0,4 ’’). Females: Ideal height 48 to 49 cm (18,9 ’’ to 19,3 ’’). Nose: Very slightly depigmented, interior of the nostrils depigmented. Teeth: Pincer bite, teeth out of line. Eyes: Prominent, round or almond shaped. Croup: Too narrow or falling away too sharply. Abdomen: Bulky or too tucked up (whippety). Feet: Splayed, too round or too long. Skull: Zygomatic arches too prominent, stop very pronounced, superciliary arches too prominent. Eyes: Light, mean look, haw-like expression. Eyes: Very light in colour, heterochromia (eyes of different colours), squinting entropion, ectropion. Jaws: Overshot or undershot mouth. Teeth: The first premolars of both jaws and the last molars of the lower jaw are considered without importance. Can only be admitted the absence of 2 PM2 or 1 PM2 and 1 PM3. Contiguous absence of these two teeth (PM2 and PM3) is eliminating. Absence of any other tooth is eliminating. Presence of dewclaws, even if rudimentary.